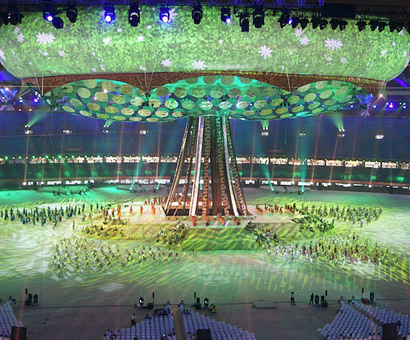 The Commonwealth Games of Delhi 2010 did not get good press in the lead up period, but the Opening Ceremony changed all that. Overnight the perceptions of the Games changed and the world's media fell over themselves looking for superlatives to describe the Ceremony. Ric Birch and ten other Spectak contractors worked on the Ceremonies, starting in early 2010. Spectak provided services including production, creative direction, choreography, showcalling, design and protocol to the Organizing Committee and Wizcraft International (the Indian production company responsible for overall production and management of ceremonies) and it was no surprise to Spectak when the balloon went up and so did the crowd. The ceremonies involved many international vendors, suppliers, consultants and contractors in a co-operative effort overseen by Wizcraft that forms a good model for major event production. Spectak's personnel worked through monsoon rains, delayed delivery dates, dengue fever, Delhi belly and intermittent internet to bring you the ceremonies and they don't get much better than this.